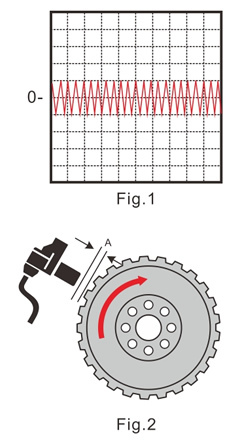 Wheel speed sensors are installed directly above the pulse wheel, which is connected to the wheel hub or the drive shaft. The pole pin inside a coil is connected to a permanent magnet and the magnetic field extends to the pulse wheel. The rotational movement of the pulse wheel and the associated alternation of teeth and gaps effects a change in the magnetic flux through the pulse wheel and the coil. 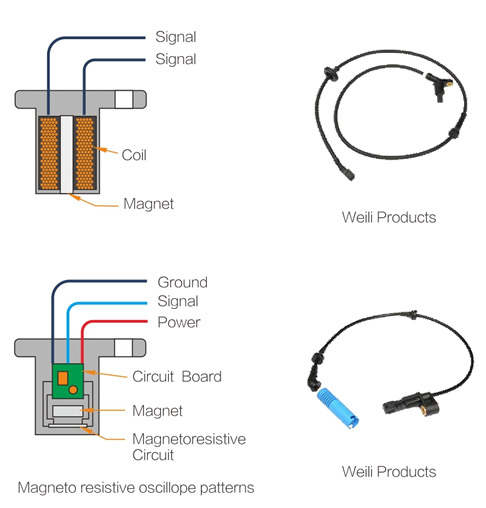 The changing magnetic field induces an alternating voltage in the coil that can be measured. The frequencies and amplitudes of the alternating voltage are related to the wheel speed (Fig. 1). Passive inductive sensors do not need a separate power supply from the control unit As the signal range for signal detection is defined by the control unit, the amplitudes must be within a voltage range. The distance (A) between sensor and pulse wheel is determined by the axle design (Fig. 2). Based on their mode of functioning, wheel speed sensors are classified into active and passive sensors. •If a sensor becomes "active" only when a power supply is connected toit and if it then generates an output signal, it is called "active". •If a sensor works without an additional power supply, then it is called "passive".